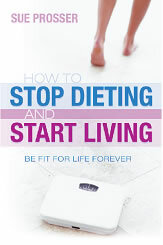 How to Stop Dieting - Start Living reveals why diets don’t usually work. Looking at spiritual factors as well as physical and emotional ones, Sue Prosser gently encourages us to understand the reasons why we see ourselves as we do. Combining Biblical principles with practical advice, she shows how we can achieve our weight goals and enjoy a fit and healthy life. Each chapter concludes with questions for personal reflection which helps the reader to personalise the teaching. PLEASE NOTE - This is the ebook version, which comes as a downloadable PDF file. Sue Prosser is the founder of Fit For Life Forever. Her background is in school teaching but she has also served as a missionary alongside her husband for many years. She struggled with her weight management for almost 40 years before finally learning how to fully surrender this aspect of her life to God. Within a year she had shed 50 pounds, achieving a healthy weight with minimal health risks which has been maintained, not by recourse to dieting (calorie or point counting and such like) but by having a Spirit-controlled appetite. Her passion is to see people set free, not only from food-related issues, but in every area of their lives as they experience new depths in their relationship with God.